BILLINGS, Mont. 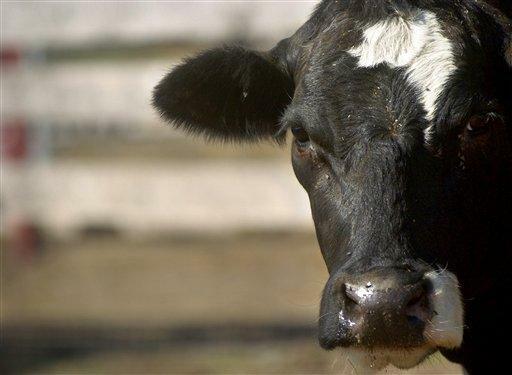 (AP) - Five years after a cow dubbed the "Unsinkable Molly B" leapt a slaughterhouse gate and swam across the Missouri River in an escape that drew international attention, the heifer has again eluded fate, surviving the collapse of the animal sanctuary where she was meant to retire. Molly B was among an estimated 1,200 animals removed from the Montana Large Animal Sanctuary and Rescue in recent weeks as part of a massive effort to bail out its overwhelmed owners. Animal welfare groups said they were forced to euthanize dozens of starving and ill cattle, horses and llamas found on the 400-acre sanctuary in rural Sanders County. The bovine celebrity herself - an overweight black Angus breed said to be sore in the hoof but otherwise relatively healthy - was removed to a nearby ranch and is headed this week to a smaller farm sanctuary. "Molly B made it OK. She's a tough old broad," said Jerry Finch with Habitat for Horses of Hitchcock, Texas, who participated in the rescue effort. "She had bad feet, but she was not anywhere near as bad as some of the others." Molly B's relocation to a 20-acre ranchette known as the New Dawn MT Sanctuary has proven an adventure in its own right. Local media stories had trumpeted her arrival at the Stevensville facility last week, including photos said to be of Molly B and new friend "Misty." Yet when New Dawn owner Susan Eakins watched one of the reports on the nightly news, video of the cow climbing a hill revealed the sanctuary had gotten the wrong animal - a male steer named "Big Mike." A mix-up left Molly B behind on another ranch. Her home since 2006, near the small town of Hot Springs, in recent years had grown into a sort of Noah's Ark-gone-wild - more than 600 llamas; at least 100 horses, donkeys and cattle; and a motley assortment of bison, camels, exotic rodents and other furry and feathered beasts. Many of the animals were breeding. Rescuers said that allowed the sanctuary population to multiply unchecked, setting the stage for conditions to deteriorate rapidly after one of the facility's two full-time employees fell ill last year. As the situation worsened, word circulated among animal rescue groups across the country. Patty Finch with the Global Federation of Animal Sanctuaries said by the time she called the Montana facility in late November to offer help, many of its animals were sick, dying or struggling to survive in increasingly cramped quarters. "Molly is a good representative of what a betrayal it was to each of these animals. The sanctuary should be a line in the sand that means never again should you suffer," said Patty Finch, who said she has no relation to Jerry Finch. Molly B's second retirement will start another chapter in an unlikely story that began January 2006, when a yet-to-be-named 1,200 pound heifer skipped her date with doom by leaping a 5-foot-5-inch fence at Mickey's Packing Plant in Great Falls. The cow raced through town with police and animal control on her heels, reportedly running into a conflict with a German Shepherd, dodging an SUV and negotiating through a rail yard. She swam across the Missouri River and later took three tranquilizer darts before eventually getting corralled. Mickey's Packing Plant employees christened the spirited cow Molly B and voted 10-1 to spare her from slaughter. A less formal vote on Molly B's fate came out in her favor this weekend. New Dawn owner Eakins said after a heart-to-heart with her husband over whether they could afford to take another cow into their 50-animal operation, the couple decided to make it work. "We made a commitment to her," Eakins said.